If you didn't hear the news about sports physiologist Allen Lim leaving the Garmin team for RadioShack, Velonews' story is a good read. Whether on the bike or off, jobs in cycling are simply hard work. Officials, coaches, managers, mechanics, soigneurs, and others work tirelessly to support the sport. Aside from slaving on the bike, the riders almost have the easy part of the job. This dedication comes from caring about the sport and the people involved, and making a change is often difficult because of the personal ties involved. It’s nice to have the world’s most perfectly planned training schedule—or at least some plan at all—but what happens when life throws you a curve and you can’t follow the plan as written? I don’t know a single person who is able to follow a pre-written plan without missing a workout due to work, weather, unexpected travel, or some other reason. But when you get back to the bike, do you pick up where you left off, only 5 days later? Do you skip those 5 days and stick with what’s already on the plan for today? Will you be “ready” for the workouts that follow? Of course you can always ask for advice. A coach can give you direction and not leave you assuming where to pick up your training. Some coaches even give specific directions on what to do when you miss a workout. If you don’t have a coach, you can ask a fellow cyclist you trust to give you some insight, but you can probably make a decision on your own. If you have identified some key goals for the season, those dates are set and it is probably more important to continue with the plan mostly as written (do the workout written on the calendar for today) so the general progression of your training stays on schedule for those big events. Chances are the missed workouts were just more intervals—maybe there were a few more or they were a little longer than previous workouts but nothing that different. Sometimes, however, there can be a few key skills or efforts that are important to “go back” and do. If you had planned a time trial, fitness assessment, drill, or something else specific to prepare you for an upcoming goal or determine your upcoming training, then you will want to work in that specific workout. If none of those were on the schedule, it’s just water under the bridge. If the break was longer than a few days, then you can assume that you’re pretty well rested (at least from a training perspective). But if it’s been a few weeks, it may take some time to feel good on the bike again and get some endurance back. That doesn’t mean going back to old workouts, necessarily, but it does mean looking forward from this point to your next goal(s) on the calendar to see if some other adjustments are necessary to your overall plan. If you’re working with a coach, this would be a good time to talk. If you’ve developed your own plan, it’s now time to revisit your planning process and come up with a new training progression to lead up to your key goals. Missing a workout or two rarely affects if you’re “ready” for a future workout, so don’t worry about that. If you miss a longer block of time, just revisit your goals and adjust your overall schedule accordingly. But regardless of what training plan you follow, missed workouts simply mean missed time and repetitions of intensity and recovery. You can’t get that back, so the best thing to do is move forward and let the missed workouts go. And for those compulsive types of us out there, that may be the hardest part of all. This guy did this for a full 9 minutes! The following is in response to a recent question about strength training (off the bike) during the race season. My first question is: what’s the goal of your strength training? Any training you do takes energy and time, and any training you do that’s not on the bike takes away energy and time that could be spent cycling. While a rider can benefit from off-the-bike training, these cross training activities need to address a specific goal, especially if they are being done during the peak part of the season. Specificity is key to top cycling performance, and during the middle of the summer that means time on the bike. Cross training can provide a fitness base but does not provide the specificity needed for peak cycling performance since it does not exactly replicate the motion and position of cycling. 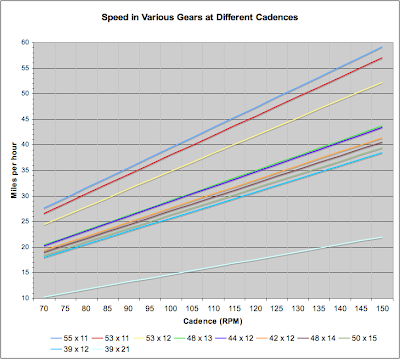 As a result, strength training off the bike during the middle of the season needs to address a particular deficiency that cannot be easily addressed through on the bike training because greater strength does not necessarily translate to higher power on the bike (see Dr. Andy Coggan’s Stength vs. power article for more detail on how more strength doesn’t necessarily lead to more power). As a general practice, for every weight/strength workout you plan, subtract that time and energy from what you will have available to spend on the bike. If you ride less during the core racing season as a result of strength training, reconsider how much weight training you do (if at all). A few exceptions apply. If you have issues with your lower back like I do, then time and energy spent on core strengthening and flexibility in the short term can be well worth the time saved from injury in the long term (see 3 & 4 above). Also, if the strength workouts take place during time you would not have been able to ride, then it may be a great addition to your training. If you have chosen to do strength training during your cycling season, I recommend always giving priority to the cycling workouts. That means strength workouts should follow cycling workouts on high-intensity days so that you have your full energy available to commit to the cycling workout. Next, make sure to balance your overall training plan so your body regularly has time to recover. Strength training also needs to be counted in your overall training hours to reflect the additional energy required to complete these additional workouts. Obviously there is a great deal more to understanding how strength training can be a part of your annual training. For more information, check out Cycling Anatomy by Shannon Sovndal or Weight Training for Cyclists by Ken Doyle, ask a cycling coach, and continue to learn more about the numerous factors and techniques for improving cycling performance. The Wisconsin Cycling Association (WCA) website has an excellent resource and reminder for all bike racers called Twelve Things You Absolutely Have to Know to Race Bicycles. The list of 12 follows, but check their page for the quick details on each point. 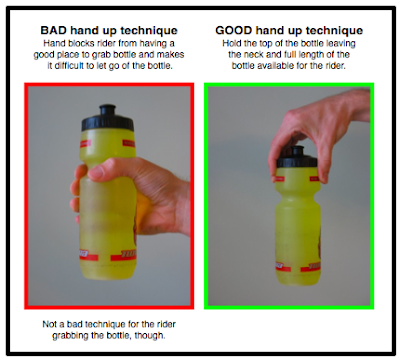 This really is essential info for all bike racers. Enjoy your race! It's supposed to be fun! Bike racks come in about as many options as there are vehicles to put them on. Roof, trunk, or trailer hitch mounted, with or without front wheel removed, holding 1–4 bikes (or more if you see those ProTour team cars). The list goes on and on and every manufacturer has what seem like infinite options. To help you get started, the following list provides some considerations to make that will help you focus on the style of rack that will best fit your needs. Picking the manufacturer and features is up to you. Make sure to consider your type of vehicle (van, SUV, sedan), amount of gear, amount of travel, your budget, and other individual factors as you consider the list above. What’s good for one person won’t work for another so don’t just get the same thing your teammate got unless your situations are pretty similar. I rarely carry more than one bike and have found that the best balance of all these factors means putting my bike in the trunk. It’s easy, secure, keeps the bike clean, and it’s free, but it doesn’t work well when I need to carry 2 bikes. I’ve used trunk and hitch racks and been moderately happy with them (work fine but limit/prevent trunk/tailgate access). My family even used to have a custom made trailer that could haul four bikes, a gross of wheels, tools, and leave enough room for a cooler, too. Next I’ll get a roof rack when I need to start carrying more bikes because it’ll allow me to get a box for carrying skis in the winter. So figure out what works for you and then get shopping. Thule, Yakima, Saris, and Rocky Mounts are just a few names out there. In the midst of putting time and effort into training and racing, one element that can often be overlooked is making sure you’ve got your head in the right place. 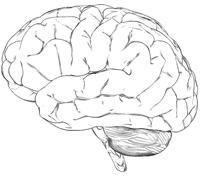 The mental aspect of cycling is just as important to success as the physical. Maintaining focus during a race allows you to follow through with race strategy, save energy, stay nourished, be aware of race dynamics, and give your best effort. During training and daily life, having a good mental outlook helps maintain the consistency and lifestyle that supports your cycling habit through persistence, healthy habits, intense effort, and quality relaxation. One of the challenges every cyclist will face is failure. At some point everyone has a bad workout, gets dropped from a group ride, experiences a mechanical problem that ruins a top placing, or fails to meet a top goal. Learning how to deal with these failures—small and large—is an important of being a cyclist. Marvin Zauderer over at Pez Cycling has an article Putting Failure in its Place, that provides an introduction about how and why people respond to failure in different ways and gives some ideas about handling it productively. It’s not a guide to dealing with failure, but it’s a good place to start thinking about how disappointments affect our outlook and how we can react them. If you’ve never taken time to think about how you deal with set backs—on or off the bike—I think this is a good time to start seeing how you can learn and adapt when you fall short of your own expectations. Big Update! Details on using new versions of WKO+ and CrossOver were posted 1-27-10. Check the new post for a much simpler process with these new versions. (Updated 6-4-09 with info to assist people using something other than WKO+ build 102 (i.e. build 103 or later). Mac users training with a power meter or a heart rate monitor have limited options for quality training software. If you want to use the best training software out there, TrainingPeaks WKO+ , but who don’t want to run Windows, the following is one option you can use. It’s not clean, it’s not pretty, and those pretty much mean it’s not very Mac-like. But it can save you from needing a box just to run Windows, using a virtualization application (Parallels, VMWare Fusion), or dual booting with Bootcamp. Oh, and maybe a little bit of luck. But hopefully the following detailed information will eliminate most of the need for luck. CrossOver Mac is a commercial version of Wine, the open source software that enables you to run Windows applications on a Mac or Linux computer without actually running Windows. Why would you want to do this? Running CrossOver Mac is a great way to run a single Windows application because it saves you from buying, installing, maintaining, safeguarding, backing up, and even booting Windows. The downside is that WKO is not a supported application in CrossOver Mac so it requires some additional manual set up, the device download into WKO+ does not work, nor does the in-app help. (Users much smarter than me may be able to custom-configure their CrossOver installation to enable device download or enable the Help viewer; I would be eternally greatful for the sharing of such knowledge.) As a result, you need to download data using another Mac application, export the data to a csv file, then import it in WKO+. This process usually takes much less time than simply booting Windows, so I haven't found it a problem. Now that you know that background, let’s get to business. Check out the WKO+ with CrossOver Mac installation directions (PDF, 42 KB; updated 1-16-10) for all the nitty gritty. If you have additional suggestions, please leave a comment. If you try this, I recommend you bring your own tech savvy and patience. Since I can’t see exactly what you did and all of your settings, I’m not likely to have many troubleshooting tips other than, “Try a clean installation of CrossOver and WKO+ following the directions exactly as written. Oh, and good luck.” But I do hope these details offer some assistance to others interested in a Windows-less WKO+ experience. Finding a one stop shop for cycling lingo is tricky. 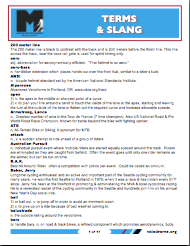 One of the best glossaries I've seen is Cycling Terms and Slang, which was shared by Bilko (a.k.a. Phil Stephens) and will soon be posted on the new Marymoor Velodrome website. It’s a great source for looking up a wide variety of words and acronyms related to road and track racing. If you’re looking for other resources, visit the Glossary of cycling terms post from last summer. For those of us in the Midwest, the outdoor cycling season gets it’s start in March. But where are the races? Currently, there isn’t a comprehensive list of all races in a particular region, but checking state association, velodrome, and a few race listing websites will help you track down the events in your area. Depending on your plans for racing, you’ll quickly find a couple of sites that work best for you. State associations: Wisconsin Cycling Association, Michigan Bicycle Racing Association, Ohio Cycling Association, Minnesota Cycling Federation, Iowa Bicycle Racing Association, and others. I recommend checking the race calendars weekly for new races, changes, and cancellations. Make sure to look ahead 3 weeks—if not further—so that you can make decisions about your race schedule and pre-register. Many races accept online registration and payment, but some still require you to mail in your registration, which is why I recommend the 3 week window. Planning ahead will often save you $5 and a bit of time at check-in on race day. If you aspire to be a Euro pro, there are a few skills you may want to start working on now. As Velonews' The Explainer shares in his Daily life in the peloton article, language skills and the art of relieving oneself make for pro peloton prowess. While English has become common in the pro peloton in the last couple of decades, being able to speak some French, Spanish or Italian will help you connect with teammates. And the fans. But learning when and how to heed the call of nature is something that will simply help you make to the end of the race without unnecessary discomfort. Or embarrassment. If you need some help, grab a copy of Rosetta Stone to polish your Polish (or any of 30 other languages), and become an on-the-bike whiz with tips (both practical and legal) from FatCyclist.com. After a couple of years racing as a junior, I finally came up with a bag where I kept all of the stuff I took to races. After a number more years, I had it down to a science so that I wouldn’t forget anything on race day and was always prepared “just in case” the unforeseen happened. So what’s in my race bag? 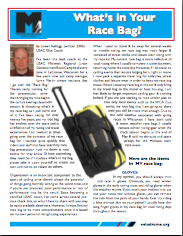 You’ll have to visit me at a race to find out because I’m going to share what’s in the race bag (800k PDF) of Lowell Kellogg, a many year cycling veteran and elite level coach. While our ingredients are eerily similar—down to mesh pockets for the shoe pocket so they can air out—he tosses in a couple extras that you may find handy in instances where nature calls or you need to darn your socks. And this great write up comes courtesy of Sgt. Bilko (a.k.a Phil Stephens), long time cyclist, announcer, bike industry guy, and all around fun guy who’s active at the Marymoor Velodrome in Bellvue, Washington. If you’ve lived and ridden in one area for a long time, you probably know all the good cycling roads in a few hour radius of home. But if you’re new to an area, you can spend weeks finding dead ends, gravel, quaint roads that become thoroughfares, and all other sorts of adventures. If you’re lucky enough that one of the sages of your area’s cycling scene has documented the best routes around, your life will be much easier. I was happy that during my time in Madison, Wisconsin the Bombay Bicycle Club put together their collective wisdom in Great Dane Rides (by Michael Bieberitz), which served as a tremendous resource for me for more than a decade. It’s a simple book of ride maps and descriptions sorted by difficulty and distance and spiral bound. It even included a note that encouraged the book’s users to photocopy pages to take along on rides. The only thing better would have been water-proof foldable maps that I could have reused more times. If you’re in the Ann Arbor, Michigan area, we’ll hit the map, too. Joel Howell has compiled his years of riding in the area into the Washtenaw County Bike Rides book from the University of Michigan Press. The included rides feature many local jaunts, as well as those that stretch well beyond the county but pass through Washtenaw at some point. If you’re looking for guides to riding in your area, search for books or resources put together by local clubs, travel and tourism agencies, or just passionate cyclists. Long time residents are sure to find new routes or rediscover lost ones, and cyclists new to an area can get on with finding the best roads, routes, and terrain without the near death experiences I’ve happened upon in new cities. If you’re near SE Michigan to race this spring and want to get some instruction about bike racing, the Ann Arbor Spring Training Series (STS) is going to have a coaching clinic at 8:25 a.m. each week for new racers. The cost of the clinic is included with your race registration or you can come for only the clinic. Check out the race flier for more details.